CFD has for a long time been applied to aircraft and automobiles. But what about an aircraft that has been converted into an automobile? Start with an F-104 fighter aircraft. Attempt to drive 800 mph and break the land speed record. CFD solution for NAE’s land speed record attempting car. 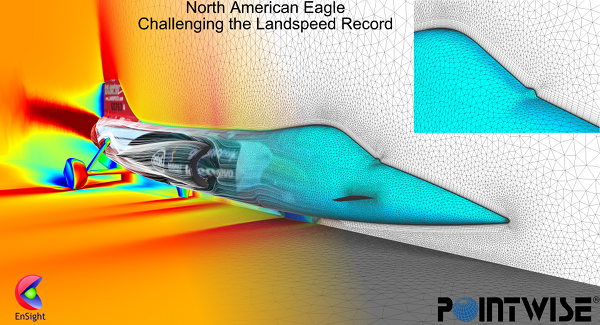 In what [IMO] should be a very interesting webinar, Pointwise and CEI Software team up with North American Eagle to share how they apply CFD to the design of the car for their attempt at breaking the land speed record. The webinar will be on 7 November 2012 at 11:00 a.m. CST. Simulation Driven Design – Who Has to Enable the Change? 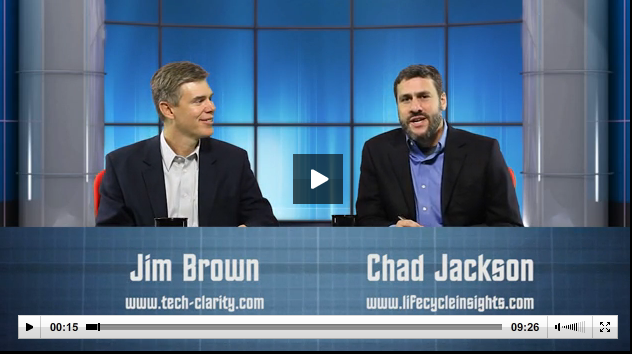 The debaters, Tech-Clarity’s Jim Brown and Lifecycle Insights’ Chad Jackson, agree that the pertinent issues are understanding of engineering physics, understanding of the simulation method, and fluency with both the simulation and CAD software. Opinions differ, however, on whether A) simulation tools move into the hands of engineers or B) whether analysts get involved further upstream in the design process. Here’s my take on the issues cited above with respect to this topic. Engineering physics – If you take the position that engineers (i.e. people designing things in CAD software) are “jack’s of all trades, master of none” whereas analysts are narrowly proficient in one area of expertise (e.g. fluid dynamics) you’d reach the conclusion that the analysts ought to be the ones performing simulation (i.e. option B above). However, I’d like to believe that the engineers designing things have been sufficiently schooled by universities in the fundamentals that they can tell whether the simulation software is giving them realistic results (which is what we’re mostly worried about, I think). Simulation methodology – On the other hand, I don’t think an engineer needs to understand a simulation methodology other than its range of applicability. And I’m hoping that someone at the company has already validated the simulation tools for the particular types of configurations to be studied. The nuts and bolts of the methodology under the hood in the analysis software are truly best left to the dedicated analyst (option B). In fact, you can make the argument that the analysts should be crafting tools to ensure they can be applied by non-experts. Fluency with the software – This is a toss up. There’s an implied belief that simulation software is much harder to use than CAD software. 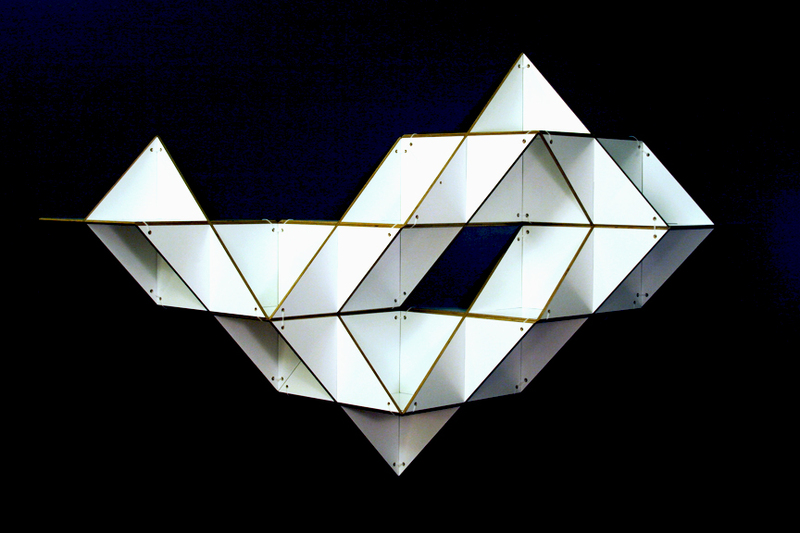 Modern CAD software is pretty darn complex and knowing how to get it to do what you need takes a degree of skill. Another component of the argument for option A was that analysts are too busy doing other analyses (presumably V&V or post-mortems) to also ask them to do work in preliminary design. However, the fundamental premise of the debate is that by doing more analysis and simulation early in the process, you’ll decrease the need for doing V&V. Therefore, this is another win for option B.
There’s one flaw in this debate however. It assumes an organization large enough to have a team of engineers designing things and across the wall another team of analysts who are analyzing things. Often we are talking about organizations where only a handful of people are responsible for both functions. Jared Baker and his winning poster. Image from U. of Wyoming. 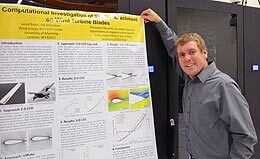 University of Wyoming graduate student Jared Baker won an all expenses paid trip to Supercomputing 12 for his poster presentation on Computational Investigation of Spoiler Attachment on Wind Turbine Blades. His 3D CFD work indicated that adding a spoiler near the root section of a wind turbine blade can increase efficiency by 2-5%. If you see Jared at Supercomputing be sure to congratulate him on his work. If you won’t be at the conference, you can hear Jared describe his work by playing the audio file on UW’s website. ERCOFTAC is hosting a short course on computational aeroacoustics to be held 30-31 October 2012 in Munich. The 2nd Australian OpenFOAM User Group Meeting will be held on 26 November 2012 in Melbourne, Australia. Intelligent Light, makers of the FieldView CFD postprocessing software, have created a Japanese language version of their website. The keynote speaker for the CD-adapco STAR Japanese Conference will be Vince Johnson from Tesla Motors. ThermoAnalytics released a new version of their CFD Manager for use in transient thermal simulations. Stanford University will introduce version 2.0 of their open source CFD code, SU2, at the AIAA Aerospace Sciences meeting on 8 January 2013. Rolls Royce North America has an opening for a CFD Methods Specialist. A preliminary announcement reveals that the next user meeting for the Code_Saturne open source CFD code will be held in the spring of 2013. This entry was posted in Applications, Events, News, People & Places, Software and tagged CD-adapco, CEI, Code_Saturne, EnSight, FIeldView, Intelligent Light, jobs, OpenFOAM, Pointwise, SU2, ThermoAnalytics. Bookmark the permalink.